On April 12, 2011 the Japanese government officially announced that the severity of the Fukushima Daiichi nuclear disaster had reached level 7, the highest on the International Nuclear Event Scale. Before Fukushima, the only level 7 case was the 1986 Chernobyl disaster, whose 25th anniversary was marked on April 26. Two and a half months after the 3.11 catastrophe, the first to affect multiple reactors, TEPCO and the Japanese government continue to struggle to bring the reactors at Fukushima Daiichi under control. TEPCO estimates that the problems could be solved in six to nine months now appearing extraordinarily optimistic and plans have been announced to close nuclear power plants deemed of particularly high risk such as the Hamaoka facility. The analysis of the health impact of radioactive land contamination by the accident at the Fukushima Daiichi nuclear power plant, made by Professor Chris Busby (the European Committee of Radiation Risk) based on official Japanese Ministry of Education, Culture, Sports, Science and Technology data, has shown that over the next 50 years it would be possible to have around 400,000 additional cancer patients within a 200-kilometer radius of the plant. This number can be lower and can be even higher, depending on strategies to minimize the consequences. Underestimation is more dangerous for the people and for the country than overestimation. 2. Distribute detailed instructions on effective ways to protect the health of individuals while avoiding the additional contamination of food. Organize regular measurements of all people by individual dose counters (for overall radionuclides) at least once a week. Distribute radioprotectors and decontaminants (substances which provide the body protection against harmful effects of radiation) of radionuclides. . .
5. The most effective way to help organize post-Fukushima life in the contaminated territories (from Chernobyl lessons) is to create a special powerful interagency state body (ministry or committee) to handle the problems of contaminated territories during the first most complicated years. Yablokov is one of the primary architects of the 2006 Greenpeace report “The Chernobyl Catastrophe: Consequences on Human Health” and an extensive 2010 follow-up study Chernobyl: Consequences of the Catastrophe for People and the Environment published by the New York Academy of Sciences, which makes the startling claim that 985,000 deaths can be attributed to the 1986 disaster. Yablokov and colleagues assessed thousands of studies of the localities and people affected by the Chernobyl disaster in Russian and other Eastern European languages. They argue that these studies have been ignored by the Anglophone scientific community. Critics, such as the British science journalist George Monbiot, have criticized Yablokov and his colleagues for attributing any increase in cancer occurrence in regions affected by Chernobyl to the radiation released in the disaster. Emphasizing the multiplicity of factors that may affect cancer rates, Monbiot states, for example, that none of the hardest hit areas subjected to Chernobyl radiation,show as dramatic a cancer increase in the 1986-2000 period as does Japan. The impact of Chernobyl radiation in Japan was negligible, yet the cancer rate there has nearly doubled since the disaster. In the wake of the Fukushima disaster, at a time when many have moved to reject the nuclear power option, Monbiot announced that he had abandoned his former criticism to embrace nuclear power as a responsible component of a green energy policy. Numerous facts and figures are given with a range of references but with little explanation and little critical evaluation. Apparently related tables, figures and statements, which refer to particular publications often disagree with one another. The section on oncological diseases (cancer) was of most interest to me. A section abstract indicated that on the basis of doses from 131I and137Cs; a comparison of cancer mortality in the heavily and less contaminated territories; and pre- and post-Chernobyl cancer levels, the predicted radiation-related cancer deaths in Europe would be 212 000–245 000 and 19 000 in the remainder of the world. I could not however find any specific discussion within the section to support these numbers. The section ends with an endorsement of the work of Malko who has estimated 10 000–40 000 additional deaths from thyroid cancer, 40 000–120 000 deaths from the other malignant tumours and 5000–14 000 deaths from leukaemia—a total of 55 000–174 000 deaths from 1986 to 2056 in the whole of Europe, including Belarus, Ukraine and Russia. These numbers confusingly, do not agree with a table (6.21) from the same author. The final section on overall mortality contains a table (7.11), which includes an estimate of 212 000 additional deaths in highly contaminated regions of Russia, Belarus and Ukraine. This figure is for the period of 1990–2004, and is based on an assumption that 3.8–4.0% of all deaths in the contaminated territories being due to the Chernobyl accident. One is left unsure about the meaning of many of these numbers and which is preferred. At the “Chernobyl Forum of the United Nations” organised in September 2005 by the International Atomic Energy Agency and the World Health Organisation, the presentation of the results of work on the effects of Chernobyl showed serious inconsistencies. For example: the press release of the WHO and IAEA stated that in the future, at most, 4000 surplus fatalities due to cancer and leukaemia amongst the most severely affected groups of people might be expected. In the WHO report on which this was based however, the actual number of deaths is given as 8,930. These deaths were not mentioned in any newspaper articles. When one examines the source quoted in the WHO report, one arrives at a number betwen 10,000 and 25,000 additional fatalities due to cancer and leukaemia. Given this it can be rationally concluded that the official statements of the IAEA and the WHO have manipulated their own data. Their representation of the effects of Chernobyl has little to do with reality. S. Pflugbeil pointed out already in 2005 that there were discrepancies between press releases, the WHO report and the source quoted in it (Cardis et al.). Up until now neither the Chernobyl Forum, IAEA nor the WHO have deemed it necessary to let the public know that, on the basis of their own analysis, a two to five-fold higher number of deaths due to cancer and leukaemia are to be expected as the figures they have published. Even in 2011 – some 5 years on – no official UN organisation has as yet corrected these figures. The latest UNSCEAR publication on the health effects of Chernobyl does not take into account any of the numerous results of research into the effects of Chernobyl from the three countries affected. Only one figure – that of 6,000 cases of thyroid cancer among children and juveniles, and leukaemia and cataracts in liquidators – was included in their recent information to the media. Thus, in 2011 the UNSCEAR committee declared: On the basis of studies carried out during the last 20 years, as well as of previous UNSCEAR reports, UNSCEAR has come to the conclusion that the large majority of the population has no reason to fear that serious health risks will arise from the Chernobyl accident. The only exception applies to those exposed to radioiodine during childhood or youth and to liquidators who were exposed to a high dose of radiation and therefore had to reckon with a higher radiation induced risk. Even if Yablokov’s estimates for Chernobyl deaths are high, the WHO and IAEA numbers are almost certainly too low. One area of continuing debate is the fate of the “liquidators” at Chernobyl. A major difference between Fukushima and Chernobyl is government handling of the aftermath. While the Japanese government can be criticized for the speed of evacuation and the limited evacuation radius, the seriousness of the issues was immediately recognized and efforts made to send people away from the stricken plant. In the case of Chernobyl, even as the state suppressed information about the catastrophe, between 600,000 and 1,000,000 people termed “liquidators” were sent to the most heavily irradiated zone to work to contain the effects of the meltdown, many with limited protection and unaware of the risks. The issue cannot be limited to fatalities. The German Affiliate of International Physicians for the Prevention of Nuclear War “Health Effects of Chernobyl” report presents extensive evidence of widespread crippling disability among liquidators. As in the case of the Chernobyl death toll, the plight of liquidators is a hotly contested topic with radically different figures emerging from different quarters. There is general agreement that about 50 people died in the immediate aftermath of the Chernobyl accident. Beyond that, studies generally don't indicate a significant increase in cancer incidence in populations exposed to Chernobyl fallout. Nor would anyone expect them to because of the data gaps and methodological problems mentioned above, and because the main part of the problem concerns the exposure of millions of people to very low doses of radiation from Chernobyl fallout. For a few marginal scientists and nuclear industry spruikers, that's the end of the matter – the statistical evidence is lacking and thus the death toll from Chernobyl was just 50. Full stop. But for those of us who prefer mainstream science, we can still arrive at a scientifically defensible estimate of the Chernobyl death toll by using estimates of the total radiation exposure, and multiplying by a standard risk estimate. The International Atomic Energy Agency estimates a total collective dose of 600,000 Sieverts over 50 years from Chernobyl fallout. A standard risk estimate from the International Commission on Radiological Protection is 0.05 fatal cancers per Sievert. Multiply those figures and we get an estimated 30,000 fatal cancers. A number of studies apply that basic method – based on collective radiation doses and risk estimates – and come up with estimates of the death toll varying from 9000 (in the most contaminated parts of the former Soviet Union) to 93,000 deaths (across Europe). Those are the credible estimates of the likely eventual death toll from Chernobyl. Claims that the death toll was just 50 should be rejected as dishonest spin from the nuclear industry and some of its most strident and scientifically-illiterate supporters. Nuclear industry spruikers will insist that no-one is at risk from low-level radiation exposure from Fukushima. The rest of us will need to wait some months or years before we have a plausible estimate of total human radiation exposure upon which to base an estimate of the death toll. To date, radiation releases from Fukushima are estimated by the Japanese government to be 10 per cent of the total Chernobyl release. 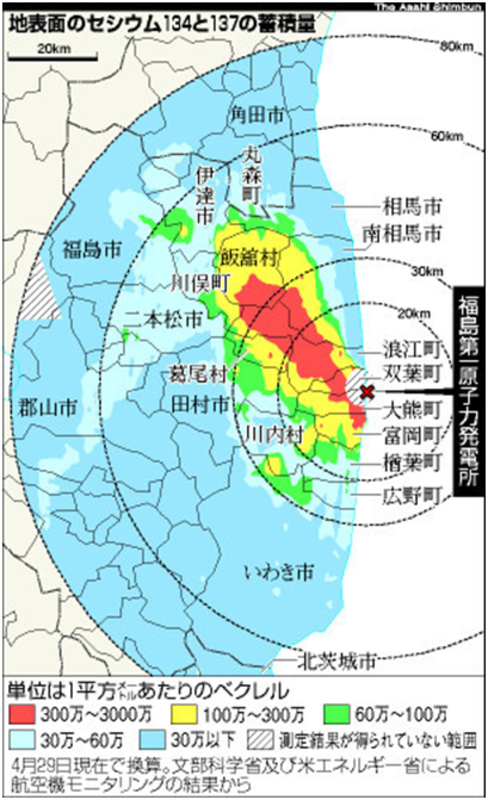 A joint survey conducted by the Japanese and U.S. governments has produced a detailed map of ground surface radioactive contamination within an 80-kilometer radius of the Fukushima Daiichi nuclear power plant. Yablokov’s Chernobyl research and the dire prediction of as many as 400,000 radiation-related cancers in the Fukushima region if wider evacuation is not considered, deserves consideration, scrutiny, and debate as the Japanese government deals with radiation releases from Fukushima Daiichi. The same is true of alternative methodologies, particularly as the “linear no-threshold model” described by Peter Karamoskos. Despite recent efforts to evacuate people from high radiation areas outside of the 20 km evacuation zone, however, Japanese newspapers reported on April 20 that at the same time, the Japanese government had increased the permissible hourly radiation dose at schools in Fukushima Prefecture to 3.8 microsieverts. The Mainichi describes this as “a level that would see students absorb the internationally recognized maximum of 20 millisieverts per year.” See “Save the Children: Radiation Exposure of Fukushima Students,” link. … the risk of cancer from radiation is 5% per sievert… That’s an average number; but an average is almost meaningless. If you are a mature, late middle-aged individual, it is maybe 1% per sievert. But if you are a child, it is maybe 15% per sievert, with a clear gender difference too at these early ages. So children are very, very sensitive compared to adults.” For an adult the acceptable risk for any activity for emergency workers is 50 mSv. For a child the equivalent risk is (50 mSv /250 mSv)*66 mSv=13 mSv. The standard suggested by Japan for children is twice this value. The change in standard to 20 mSv corresponds to a change to 0.3% risk in cancer later on in life. In recent weeks, the issue of radiation and the 300,000 children of Fukushima has moved to the center of debate in assessing Japanese government handling of the Fukushima meltdown, even as the seriousness of radiation issues has grown with the belated disclosure by TEPCO of the multiple disasters experienced at the outset, and still far from under control, in Fukushima Daiichi. At times of emergency, we cannot do without exceptions to standard rules and we are indeed capable of setting them up, but in any case, international common sense ought to be respected. It is wrong to forcibly push through conclusions that happen to be convenient only for the administrative authorities but which are utterly unacceptable by international standards. Such conclusions are bound to draw criticism from the international community. This time, upon discussing the acceptable level of radiation exposure for playgrounds in primary schools in Fukushima, they have calculated, guided and determined a level of “3.8μSv per hour” on the basis of “20mSv per year”. It is completely wrong to use such a standard for schools that are going to run a normal school curriculum, in which case a standard similar to usual radiation protection measurement (1mSv per year, or even in exceptional cases, 5mSv) ought to be applied, and not the one used in cases of exceptional or urgent circumstances (for two to three days, or at the most, one to two weeks). It is not impossible to use a standard, perhaps for a few months, of 10mSv per year at the maximum, if the public is rightly notified of the necessity of taking caution, and also if special measures are to be taken. But normally it is better to avoid such a thing. We have to note that it is very rare even among occupationally exposed persons (84,000 in total) to be exposed to radiation of 20mSv per year. I cannot possibly accept such a level to be applied to babies, infants and primary school students, not only from my scholarly viewpoint but also from my humanistic beliefs. You rarely come across a level of 10mSv per year on the covering soil if you measure the leftover soil at a disposal site in any uranium mine (it would be about a few mSv per year at the most), so one needs to have utmost caution when using such a level. Therefore, I strongly protest the decision to use the standard of 20mSv per year for school playgrounds, and ask for revision. (Translation by Tanaka Izumi) Complete translation available here. The U.S. National Academy of Sciences BEIR VII report estimates that each 1 mSv of radiation is associated with an increased risk of solid cancer (cancers other than leukemia) of about 1 in 10,000; an increased risk of leukemia of about 1 in 100,000; and a 1 in 17,500 increased risk of dying from cancer. But a critical factor is that not everyone faces the same level of risk. For infants (under 1 year of age) the radiation-related cancer risk is 3 to 4 times higher than for adults; and female infants are twice as susceptible as male infants. The Mainichi also reports protests from various corners. Hirokawa argues that while the Soviet government may have been irresponsible in its initial approach to the Chernobyl radiation release, it undertook a massive effort to evacuate children from Kiev, 120 kilometers away from the crisis zone, between May and September 1986. Fukushima City is just over 50 kilometers away from Fukushima Daiichi. At the currently approved 20mSv, Hirokawa points out, Japanese children could be exposed to four times the radiation of children in Ukraine in 1986. He writes, “… an hourly rate of 3.8 microsieverts is a number not all that different from readings at the dead ruins of Pripyat. I don’t want to imagine Japanese children running and playing in this ruined shell of a city.” Pripyat, built originally to house Chernobyl workers, is the abandoned city at the heart of Ukraine’s “Zone of Alienation”. We have, likewise, noted important differences in the handling of the disasters at Chernobyl and Fukushima. Yet it is important to note that Wakeford’s praise ignores the most important revelations of TEPCO’s and the Japanese governments cover-ups and recklessness, as in its decisions to expose Fukushima children to 20 mSv of radiation on a long-term basis. As the nature of the Fukushima crisis relative to Chernobyl continues to be contested, the important issue of radiation exposure of Fukushima school children remains at the center of public debate. To date, the Japanese government has failed to respond effectively to critics of policies that pose long-term risks to the nation’s children. Matthew Penney is an Assistant Professor at Concordia University in Montreal and a Japan Focus associate. He is currently conducting research on popular representations of war in Japan. He can be contacted at penneym@hotmail.com. Mark Selden is a coordinator of the Asia-Pacific Journal and Senior Research Associate in the East Asia Program at Cornell University. His recent books include Chinese Society: Change, Conflict and Resistance; China, East Asia and the Global Economy: Regional and historical perspectives, The Resurgence of East Asia: 500, 150 and 50 Year Perspectives, and War and State Terrorism: The United States, Japan, and the Asia-Pacific in the Long Twentieth Century. His homepage is www.markselden.info. Recommended citation: Matthew Penney and Mark Selden, What Price the Fukushima Meltdown? Comparing Chernobyl and Fukushima, The Asia-Pacific Journal Vol 9, Issue 21 No 3, May 23, 2011.